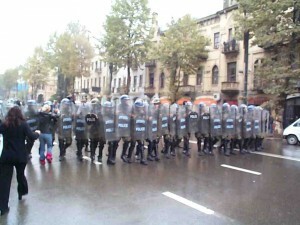 08.11.2007 – After some days of in general peaceful protests in Tbilisi, violence has been exercised by state forces, and in return by a small part of protesters. The declaration of the state of emergency by the President and the reasons given hereto leave however serious doubts in European observers of the political landscape of Georgia if this country can remain stable under the present government. Stability in European terms means also general approval of a system by the people of the relevant country, and here evidently in Georgia nothing is left between the government and the political elite. It is therefore time for special EU activities for Georgia, which evidently leans to Europe, and where the active participation in the EU Neighbourhood Policy never has been in question. In contrary, some young Georgian intellectuals favour now an always stronger role of the EU in the country – for education towards tolerance, values, a true pluralist democracy, the rule of law and transparency. This must be understood by Europe, demands the CIS and Caucasus expert of LIBERTAS, Hans-Juergen Zahorka, himself a former Member of European Parliament and from January 2008 also Chief Editor of “European Union Foreign Affairs Journal”, in particular in view that the state of emergency now is directed against basic rights like the right of assembly and above all the freedom of the press. Access to information is of extreme significance to a people and restrictions like in Georgia are not acceptable at all. It must be noted that a popular oppositional TV station has been closed – by police forces with gunpoint to heads of journalists before running cameras! – before the State of Emergency has been declared! Georgia should concentrate on reforms, like it did with a lot of success until now, but would have to tackle also social problems and the rule of law which remains an open issue for many people. Arbitrary raids by police forces against companies and the impression Georgia now leaves will be a heavy mortgage on the country, which should do everything to attract investors. This can normally not be achieved by states of emergency. After all, the European Union is asked now to act, not only to react. The circumstances, under which the announced presidential election on 5.1.2008 will be held, must be scrutinized thoroughly. All media must be immediately free and admitted – but in the case of Imedi TV the government seems already to be behind the point of no return. All people who had openly exceeded their competences must be judged before an impartial and not state-influenced court. In this context it must be noted that also the country’s Ombudsman (Public Defender) has been beaten severely, as well as many politicians, NGO representatives etc. The EU has excellent ways and means, including financial as well as trade policy-related ones, to keep Georgia on a European track. If Georgia wants of course another way, it can go this way. But it must know that any further economical recovery cannot be reached only with the help of Turkey, or a non-existing Caucasus integration, or above all not Russia. And it should remember the many people and entrepreneurs who basically liked Georgia as a target place for foreign direct investment, but now refrained immediately. After all, it would have been better for the country not to pump all the huge amounts into the army and the police forces, but rather prevent social outbreaks, e. g. by retraining and adult education of socially problematic groups and in the regions. That means that the army should not be neglected, but Zahorka expressed his opinion also in this sense: Georgia should concentrate a bit less on NATO and more on EU. This cannot be rejected by Russia, and on the other hand it leaves the country to prevent effectively any possible situation where some Georgian army officers would start shooting at the borders of the breakaway regions, which in case of a NATO membership would pull the whole alliance into a regional conflict. This might be also one of the reasons why evidently NATO is not to keen on a Georgian membership right now. The president should know that the elections on 5.1.2008 will be judged according to the equality of chances for all candidates. This does not seem to be guaranteed. The consequence might be a further alienation between the Georgia government and the European Union – to the detriment of the citizens of this sympathetic country. This is a photo which reached LIBERTAS from Tbilisi’s Rustaveli Boulevard: A young woman tries to halt the march of the riot police. Tbilisi, Georgia – Transparency International Georgia (TI Georgia), as a non-partisan, Tbilisi-based non-governmental organization, sees the need to complement the information being circulated about the events of November 7, 2007 in Tbilisi, Georgia. TI Georgia is able to provide a first hand account of the government’s dispersal of the opposition-led protests that had been ongoing since November 2, 2007. Yesterday, TI Georgia witnessed the violent dispersal of protesters. The government has responded that the dispersal of the protesters was necessary because Rustaveli Avenue was closed in front of Parliament and that heavy force was used because of the protesters’ aggression. The level of violence used was inappropriate to the situation. Police officers and riot police not only violently dispersed the protesters, who were unarmed and varied in age and gender, but continued to pursue them down side streets and into shops and other buildings. Local television stations showed people being punched, kicked, and beaten with batons as they were running away, on the ground, or already subdued by other officers. An excessive amount of tear gas was used by the riot police. According to official numbers, 508 people were hospitalized due to their injuries and at least 100 remain hospitalized the next day. Starting November 2, 2007, the demonstrators came with four demands: (1) conduct parliamentary elections in spring 2008, instead of late 2008; (2) create new election administrations with representatives from political parties; (3) change the current majoritarian election system – a first-past-the-post, winner takes all system; and (4) release political prisoners and prisoners of conscience. For the first five days of the protests, the opposition leaders emphasized the peaceful nature of the demonstration and their commitment to constitutional processes. The lack of an adequate response from the government, however, aggravated the situation and protestors increased their demands, eventually calling for Saakashvili’s resignation. These calls for resignation have been interpreted by the government as an attempted coup. In the afternoon of November 7th, the government provided television stations with taped cell phone conversations beginning in 2005. The conversations were between various opposition leaders, their relatives, and, ostensibly, Russian spies. The government used this information to assert that opposition leaders were serving Russia’s interests. However, the material provided little information and was largely interpreted as a late attempt to discredit the opposition leaders and incite infighting among the recent coalition of opposition parties. Most importantly, the information revealed on the taped conversations in no way provided justification for the government’s excessive use of force against the protesters, especially when this evidence comes after the initial attack. Throughout the day, journalists were vulnerable to attack. Many journalists, both local and international, have reported being physically assaulted by the riot police and regular police force and have had their equipment and material confiscated or broken. A little before 9 p.m. on November 7th, Imedi TV, the most popular television station in the country, and Kavkasia TV, went off the air. Before losing the signal, Imedi’s anchorman reported that the riot police had surrounded the building and were entering. At approximately 10:30 p.m., Prime Minister Noghaideli declared a state of emergency and subsequent restriction on the dissemination of information. When the government was asked why TV stations had been taken off the air, the response was that it was a state of emergency, even though the two channels had gone off air at 90 minutes before the announcement of a state of emergency. Just as other TV stations are now complying with the order to not broadcast news, so could Imedi have complied. Transparency International Georgia believes that access to information is a key instrument in the fight against corruption, the promotion of government accountability, and the creation of democratic institutions. It is paramount that democratic methods are used to establish institutions in Georgia and that the process by which the Georgian state is built has public approval. Transparency International Georgia (TI Georgia) is a national chapter of Transparency International, the global civil society organization leading the fight against corruption. TI Georgia was established on 7 May 2000 as a local non-governmental organization committed to combating corruption in Georgia through the promotion of transparency and accountability. Our mission is to serve as the primary source of information on corruption reform in Georgia, assist the Georgian Government and the broader public in facilitating reform in sectors where corruption exists, and build and strengthen institutions. To fulfill this mission, TI Georgia: establishes programmatic activities that target structural corruption in specific sectors; promotes access of local populations to information on existing problems and changes initiated to address these problems; encourages input on reform from local and international experts; assists the Government in drafting policy; and produces analysis and public policy recommendations on current activities and on future reform.